You'll be £19.99 closer to your next £10.00 credit when you purchase A Salute to One of 'The Few'. What's this? Order within the next 4 hours, 45 minutes to get your order processed the next working day! of research to piece together this biography. Peter joined the RAF in November 1937 on a four-year short service commission at the age of twenty. In July 1938 he was posted to No. 87 Squadron being equipped with the then new Hawker Hurricane fighter. After war had been declared the Squadron was posted to Boos in France in support of the British Expeditionary Force, becoming operational on 10 September 1939. In March 1940 he was transferred to 501 Squadron in Tangmere and then again in April to 74 Squadron as an operational pilot at Hornchurch, equipped with Spitfires. It was from here that he fought his part in the Battle of Britain. For those who may have forgotten 'The Few', this stirring and yet sad story tells of the all-too-short life of one of the 544 young men who gave everything to defend Great Britain from Nazi aggression. The book is a good read with some interesting peripheral detail. Recommended. This is one of the best - no, the best, books i have read about the battle of britain. Not only the history leading up to it but all the personalities involved - the major players if you will! 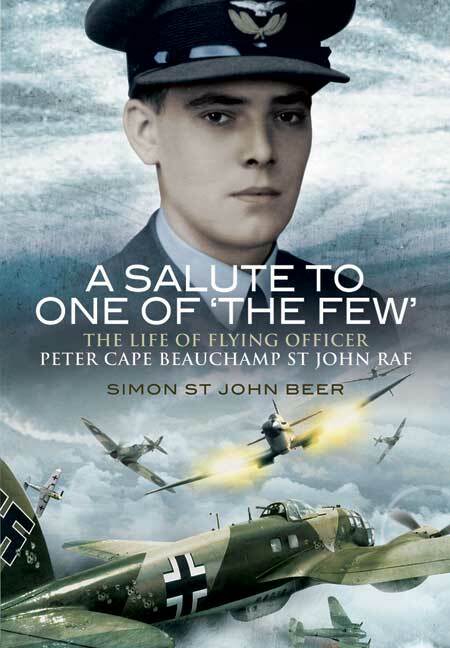 But the real hero will always be flying officer Peter Cape Beauchamp St John. A VERY moving account of the life and death of an ordinary but very brave man, who saw fit to do his duty so that we are fortunate enough to be here today. The research involved and the photographs are just superb - this is simply a fantastic document, not just a read - something you will want to keep. The last few pages made me reflect on my life - 544 pilots lost their lives between 10th july and 31st october 1940. This is one story - i wonder if the author will write more ? i would certainly buy them. Wow! Very detailed, incredibly easy to read and at the end very sad. Ideal for students of First World War and Second World War history, aviation and Battle of Britain buffs. Informative, detailed and very well researched. Ideal for school children as it covers so much curriculum ground surrounding both world wars. I never understood why the Battle of Britain was a special part of our history. Now I do. This book explains what happened at the end of the first war and follows the international build up to the Second World War. It does this in a detailed yet highly readable way interwoven with the life of Peter St John until his death when he was shot down in a Spitfire in the battle of Britain. The clever timeline lets you know where you are and takes you through time as it happens in a way that really keeps you reading. The feeling that you are with him flying a Spitfire is so real. As 42-year-old I possibly should have known why the battle of Britain was so important. This book is so good because it doesn't just look at the men in their aeroplanes but covers why this air battle ended up happening and probably more importantly, why it was so vital that Britain must fight and win the battle of Britain. A great read and a great book! Highly recommended. One of those books you can't put down! This book descibes a short life as if the author was indeed Peter himself! The clever way he describes the emotions and sets the scene, combined with relevant World events that led up to the Battle of Britain and the death of one of the forgotten few. It would make a great TV drama and a great educational book for schools.